It's not so common for SuperPhillip Central to be working on the weekend, but that's our privilege when we have such great readers and commenters to push us onward. Today we have a new review to share with you for a Nintendo 3DS eShop game, Mario and Donkey Kong: Minis on the Move. For the longest time, Mario and Donkey Kong have been rivals, ever since Mario was known as Jumpman and was a carpenter instead of a plumber. Since then, the two have faced off in a variety of games, especially those with the moniker of Mario vs. Donkey Kong, the first of which releasing on the Game Boy Advance. While that game was more akin to the gameplay of the original Donkey Kong, the DS iterations have been Lemmings-style games, 2D and all. 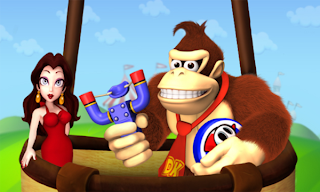 It seems now the portly plumber and the big ape have set aside their differences to make the first 3D entry in their series of games, Mario and Donkey Kong: Minis on the Move, a 3DS eShop exclusive. Should you move on over to the Nintendo 3DS eShop post-haste to pick this game up? In Mario and Donkey Kong: Minis on the Move, there are an abundance of modes and mini-games to play, but at first you are limited to Mario's Main Event. However, once you've completed the first ten tutorial levels, new options open up. As more levels are completed, even more content is unlocked. 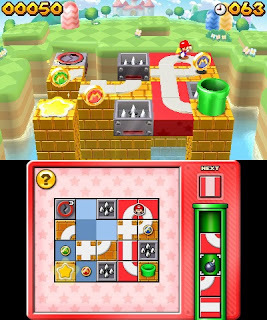 Mario's Main Event has the main objective of using the falling tiles (coming in straight and curved varieties) that drop into the green pipe on the touch screen to create a path for your Mini Mario to reach the goal. You have to work quickly as up until it exits from its starting position, a green pipe, Mini Mario is constantly moving forward, and if there is no path for it to follow, it will teeter over the edge. You also have to work quickly because the pipe that holds all of the falling tiles can only hold so many before it overfills, also resulting in a level failure. lot of complexity to this game. 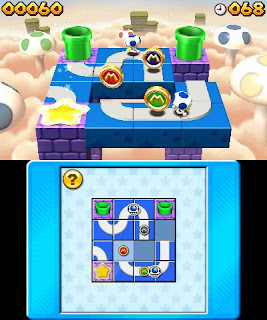 Meanwhile, Puzzle Palace follows the same concept of Mario's Main Event, but instead of using falling tiles to create a path for your miniature toy to follow, you use a preset amount of provided titles to accomplish this task. This is probably my favorite of the four main modes of Mario and Donkey Kong: Minis on the Move. It flexes your mental muscle, especially in later levels as you try to ponder and surmise where to place the invaluable and limited supply of tiles. can you collect all of the M-tokens too? The third mode in the game is Many Mini Mayhem, where you need not worry about placing new tiles in a level, you simply slide around tiles and rotate special pivot tiles to create a path so that all Mini toys make it the goal. You get bonus points for having the Minis reach the goal together. It's quite chaotic as you frantically slide tiles to make a safe journey for the Minis. feel like rubbing your head and patting your stomach. The final mode that unlocks is called Giant Jungle. 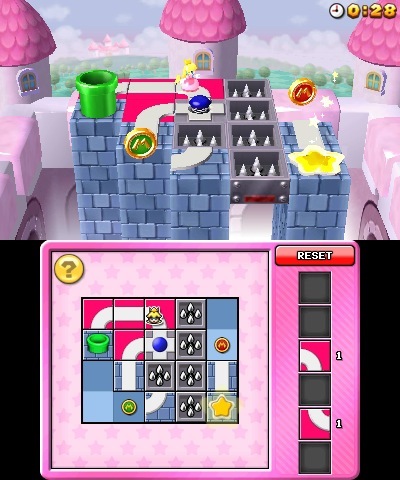 This is different from the other modes as there are but three levels to play. Don't think this is some quick play, however, as each level demands you play it over and over again. You see, each level contains ten stars that need to be collected, though you need not gather them all in one go. There is a maze of obstacles, enemies, and tiles to deal with, and placing tiles to move your Mini and make a path that gets it through as many stars as possible (as well as timer icons to give you more seconds to work with). Just remember that you don't earn any stars unless your Mini makes it to the goal. Easier said than done, as you not only have to be fast with tile placement, but you need to plan your moves accordingly and think ahead. with the Giant Jungle mode. Stars are what unlocks new toys in the Mini Toy Collection. In the first three modes, stars are earned by collecting all three M-tokens in a given level. Generally just beating a level is pretty easy to do, but when you try to gather all three M-tokens, that is where the true challenge rears its head. 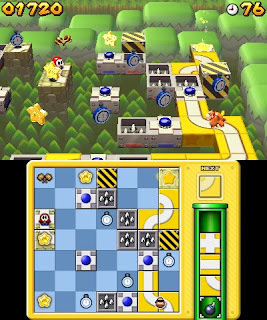 Outside of the direction tiles that serve as your Minis' path to the goal, there are a myriad of other objects that appear in the game such as pivot tiles; trash cans that allow you to throw away up to three falling tiles to create one new special tile; hazardous spikes; enemies like Shy Guys; miniature Donkey Kongs that toss your Mini three tiles ahead; keys that unlock special goals; conveyor belts; warp pipes; roadblocks; and so many more. Levels constantly introduce new concepts to the player so you're seldom bored. To also help players not get bored are a collection of entertaining mini-games. These come in four varieties, having you shoot Mini Marios on a slingshot into targets, where the furthest away targets net the most points. There's Fly Guy Grab, where you nab Fly Guys and reel them in for points. 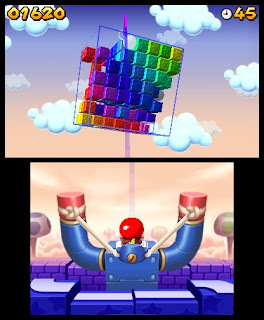 There's my favorite of the bunch, Cube Crash, where you unload a mess of Mini Marios at a shape made up of cubes. If you destroy the object by using only one Mini Mario, you get double the points. 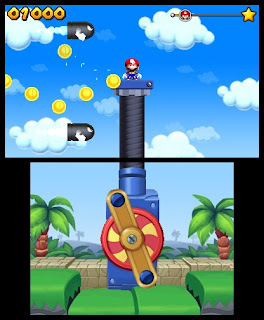 The final mini-game has you spinning a lever to raise and lower a Mini Mario standing on a platform to dodge Bullet Bills and to collect coins. These mini-games are fun diversions, but the majority of them won't keep players coming back for more. If you have a passion for designing your own levels, Mario and Donkey Kong: Minis on the Move also has that option available. 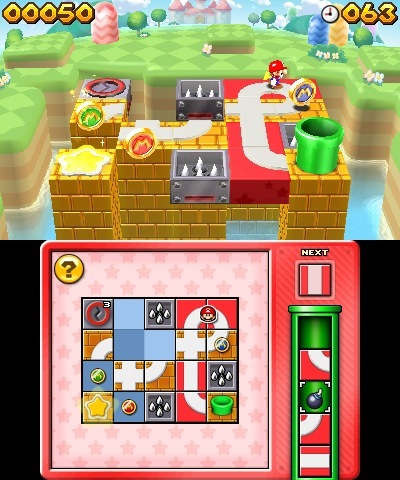 In the game you can not only build your own levels using all of the tiles and object types the game throws at you in the regular game, but you can also put your designs on Nintendo's servers, allowing friends and total strangers to enjoy your creative concoctions. The only drawback here is that it can be rather difficult becoming one of the most played levels, given how the system is set up. Mario and Donkey Kong: Minis on the Move features a colorful art style, though I do notice that it has a bit of a washed-out look to the game at some parts. The 3D that the game uses is really impressive and makes everything look all the more better. The music is a mix of new tracks and various remixed Mario songs, such as the castle theme from Super Mario 64 and the jazzy jungle track of the original Donkey Kong Country. move Mini Mario in Elevation Station. Overall, Mario and Donkey Kong: Minis on the Move offers a myriad of modes, options, and variety that makes it one of the top titles on the Nintendo 3DS's eShop. There's a fine mix of puzzles that make you work fast while needing to carefully plot your moves, ones that force you to think outside the box, and ones that will inspire you to create your own level designs and share them with the world. Mario and Donkey Kong is a welcome addition to the 3DS eShop, and it's a game that I hope gets the recognition and sales it so very much deserves.